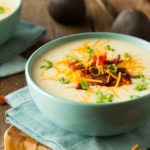 As the temperature begins to cool off it puts me in the mood for my favorite soup – Instant Pot Potato Soup. Potato soup has always been one of the most requested soups in our house. There is just something about a warm bowl of thick and chunky potato soup. Instant Pot Potato Soup – our favorite, easy to make soup! And it’s even better when it is loaded with bacon and cheddar cheese! But when I purchased my first Instant Pot, I knew that my hours of hovering over the stove top watching boiling pots would come to an end. 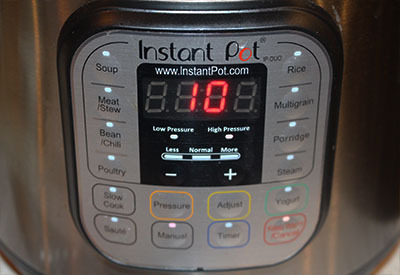 This recipe takes only 10 minutes of cooking time in the Instant Pot. But the best advantage of all is that you can ‘fix it, and forget it’. Just assemble all of the ingredients, throw them in the pot and let the magic happen. Of course, just like with this Instant Pot Potato Soup recipe, there may be a little browning or sauteing to do. However, you would have to do the same if you were making it on the stove. What makes this soup so delicious is the combination of flavors. The thick and hearty taste of chunky potatoes flavored with a little onion are mixed perfectly with little bits of crunchy celery. 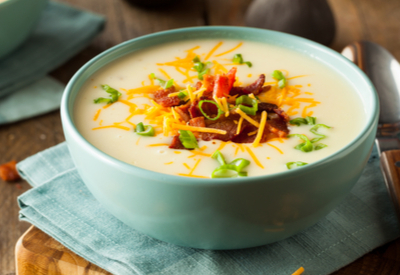 And of course, everyone’s favorite part of Instant Pot Potato Soup – cheese and bacon! 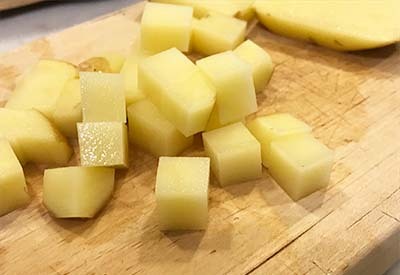 Cut your potatoes in even chunks for them to cook evenly. I like to use peppered bacon and sharp cheddar cheese to make the depth of flavors even more intense. And if you are looking for a smoother consistency soup, replace the Russet potatoes with Yukon Gold. The Russet potatoes hold their shape better in the cooking process. However, Yukon Gold potatoes have a buttery taste that compliments the Instant Pot Potato Soup recipe perfectly. They just don’t hold their shape as well as Russet potatoes. But either way you decide to make it, it will soon become one of your favorite soup recipes. A heart warming soup that everyone loves filled with all the fixings of a loaded baked potato. Turn the Instant Pot on the sauté. Once the display reads HOT, add in the uncooked, diced bacon. Saute for 1-2 minutes until grease begins to form. Add the onions and celery and cook until the bacon is crisp. Turn the Instant Pot off and add in the minced garlic and stir for one minute while the pot is still hot. Add the chicken broth, cream of celery soup, potatoes, salt, pepper and cayenne pepper (if using) to the pot and stir well. Place the lid on in the sealing position and pressure cook/manual over high pressure for 10 minutes. While the potatoes are cooking, in a small bowl, whisk together the milk and flour and set aside. Once the cooking time expires, perform a controlled quick release of the pressure. Open the lid and stir in the milk/flour mixture. Turn the pot back on to sauté and thicken the soup for approximately 4-5 minutes, stirring frequently. Add in the cheddar cheese and stir until melted. Add additional salt and/or pepper to taste. in the 2 cups of cheddar cheese and stir until melted. Garnish with additional cooked and crumbled bacon, shredded cheddar cheese and green onions.